The big day and what do we do? 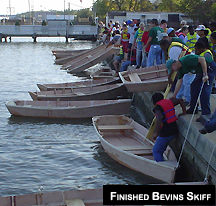 The boats featured at our schools are for beginners. As we gather around the work area, you will notice materials piled neatly to be given out as needed as you progress on the boat. Each phase of the boat construction will be described and demonstrated before you start the next step towards completion. 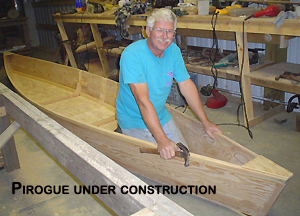 You will be taught how to bend and mold wood into a small craft that will bring you a great deal of fun on the water. Regardless of your skill level you will complete your boat and feel a great deal of pride in your completed boat and accomplishment. Everything you usually take to outdoor events; lawn chairs, bottled water, snacks, sun block, hats, outdoor shoes, in cooler weather bring warm clothes, camera, film and all the accessories you need, etc. 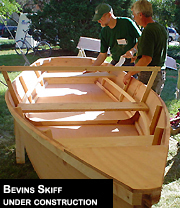 Hand Tools only ( no power tools) are needed to build your boat. A complete list of tools will be supplied with your application. They are things like a 6' folding ruler, cordless drill with backup battery, several sizes of small drill bits, hammer, backing hammer, bevel gauge, and multiple 4" C clamps, etc. Plus bring safety glasses and a 50ft long rope 3/8" or thicker to tie your boat onto your car or truck when leaving. Need a different School schedule? No problem! We'd be happy to accommodate your schedule for family retreats, organizations, church groups, schools, or corporation. Just give us a call, tell us what you need, because it is possible we could accommodate your group fairly soon. We do everything possible to make this a fun and safe event for everyone. We expect everyone will follow the safety rules. Please bring a life jacket for each member of your team. It must be worn while in the boat or involved in water activities. Approximately five years ago – we were living in North Florida on a country gentleman’s farm. We loved the country environment it was so relaxing to be away from the hustle and bustle of busy city life. We were learning about caring for cows, goats, chickens and a donkey, as well as how to hay and build fences. We had a nice barn to build boats and other wooden projects as well as a guest cottage on the farm. Karl had a great career as a master boat builder at Merritt’s Boat Works in Pompano Beach, FL., Merritt’s is world renown as building the finest hand built custom sport fishing boats in the world. Karl is also an accomplished machinist so by combining his skills with wood and metal all boats are fair game. We thought that people would love to come to the farm and build a small boat. Students working along side Karl learning all the way would end up with a small finished boat they could enjoy as well as feeling proud of a job well done. Word of mouth spread and several people did in fact build boats at the farm. They are still today enjoying their boats serving up all the fish they catch. At the same time we were introduced to a new concept, combining farm activities with fun-a twist – called Agri-Entertainment or Agri-Tourism. Bringing people to the country to experience a bit of farm life in the country as well as having some fun doing something on the farm. This fit exactly into what we thought we wanted to do – share fun we were having on our farm combining skills we brought with us from the city! Fast forwarding – we wanted to move to an area that had seasonal changes and water near by. We looked at many farms and found one we like – in NW Tennessee – Big Sandy. We are now settled in to our new location and began revisiting the idea of people learning the skill of assembling a small wooden boat. After researching the idea we found that there is a grassroots network of Family Boatbuilding Vacations held generally once a year in July. Encouraging families to bond together making a completed boat, experiencing the use of a hammer and the feel of a wooden boat on the water. We wanted to take the concept year round to make it better coincide with vacationing families please see our school schedule. After the boat is built you can float around in your boat and take it home! What is the media saying about our school? sponsor of the Tennessee Boat School.